Access Guidelines | California Public Protection & Physician Health, Inc. Thank you for your interest in CPPPH’s Guidelines. Copies are available at no cost. Please fill out the form below and click "Save" to submit the form. 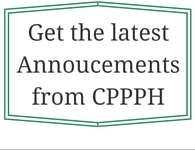 You will be emailed a link to the CPPPH Guidelines at the email address provided below. You will be emailed a link to the CPPPH Guidelines at this email address.